In the far reaches of the Galapagos archipelago there is a remote island that is more like an ancient crumbling volcano. It’s a place apparently forgotten by time called Darwin Island. To the South there is a magnificent natural arch, close to one of the few remaining ocean sanctuaries. It is at this place that a mysterious parade of giant whale sharks passes by. The whale shark is the largest fish ever to have lived. Most of these sharks are pregnant females about to give birth. What has drawn them to this place? Where are they going? Scientists working for the Galapagos National Park have come to the island to track these dinosaurs of the sea and to follow them wherever they travel. The team lies in wait, ready to interact with the whales. Their job today is to place tracking devices in their thick skins. This is no easy task, however. A female who is almost 12 meters long approaches and they rise to meet her. Whenever she breaks the surface, her device will allow scientists to determine her location. She goes on her way seemingly oblivious to the procedure going on around her. She has no idea that she’s now part of one of the most ambitious marine animal location studies ever undertaken. Galapagos offers a real Jurassic Park situation, according to naturalist and photographer Jonathan Green, who has been working on Galapagos for over 20 years. Although they are fascinating creatures, scientists know more about mice and ants than they do about whale sharks. Whale sharks belong to a class of cartilaginous fish. At full size they can reach up to 18 meters in length and weigh 30 tons. These giants have a lifespan of about 70 years. They roam the oceans scooping up a diet of plankton and small fish. They gather off the coast of Mexico and Belize to feed or off the Western coast of Australia, but nothing is really known about where they go to give birth, how they mate, or where they mate. The answers to these questions could contribute crucial information for scientists to be able to preserve these creatures. 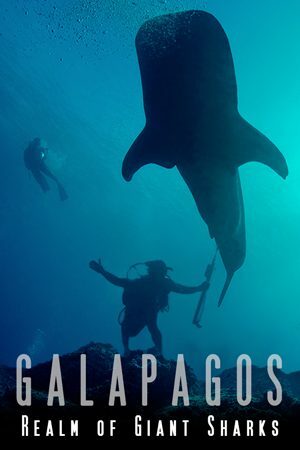 In an exciting merger of science and filmmaking, Galapagos: Realm of Giant Sharks uses the latest technology in high-resolution photography to show you the private world of one of the ocean’s largest and least known creatures. Watch this film now.